Sadly, the All Friends’ tour isn’t always blessed with clement weather. It’s been raining rabbits and penguins for days now, so they can’t go outside. “Aaaaaargh I’m so bored!! Why won’t you get sunny already stupid weather!!!”. Mia was screaming, throwing a tantrum and rolling on the floor, when Aira approached with her usual smile. The three of them were overjoyed, running toward Aira to get their melonpan. “Hey, where is Naru?” “She left in a dreamy just now” “She said her friends are waiting”. The girls looked at the downpour outside, thinking about why Naru was so agitated. Naru was alone, looking at the cloudy sky in a park. Two girls each holding an umbrella joined her, one of them tapping Naru’s shoulder. “An! Ito! I knew you’d have the same idea as me” Naru turned around to face them, her expression showing she knew they’d meet again here. The trio looked at the sky in silence, when Naru asked them “Hey, let’s sing together!! It’s been so long!”. “Are you serious? And it’s still raining you know?” “Good idea! Doing a Show here totally fits us! !” Ito was slightly blushing at Naru’s sudden proposal while An was all pumped up. In the rainy park with no audience, the trio played Doshaburi HAPPY! and started their Prism Show. When they finished their Prism Show, they could feel the sun shining on them. The clouds had started to part, and before they knew it, the rain had stopped. “Well, we actually didn’t promise to meet here” “What?! Then how did you know you’d find each other in the park?”. Laala was surprised at An’s answer. Aira asked Naru if something was wrong, and she could only answer with a smile. What the hell wow, that ending, I was not expecting that. So An and Ito weren’t there actually and it was some kind of illusion. Or maybe they’re in a parallel world and the world the All Friends are currently in and the world An and Ito are in connected together for a moment because of the rain. Hence why Lala could see them. There are too many unaccounted details but that’s what makes it interesting. Anyway, Ito and An actually didn’t join the party yet. I think they moved to a different world than the weird forest from episode 3 and 4, but didn’t start exploring it to find more Prism Sparkle as they couldn’t get out of the Magic Bus because of the rain. The Magic Bus’ real name is NEW Prism Trailer but I call it Magic Bus. According to my understanding of the Pretty All Friends prologue text, the characters in Pretty All Friends are different and slightly older than their selves in their respective anime. But at the same time, the events from their anime seem to have happened as well, despite them being from parallel universes. For example, Naru, An and Ito already know each other and their songs. Characters with a student master relationship like MARs and Mia have that relationship too in Pretty All Friends, as shown in Episode 2 when Rizumu and Mion joined. The prologue also said that all the Prism Stones Shops in multiple universes got connected by the Rainbow Bridge, and when Rizumu and Mion joined they said they got to the “Aurora Country” world by taking a Rainbow Bridge too. So my idea is that the Ito and An who appeared before Naru are traveling between worlds too, and they temporarily managed to connect with Naru because of the rain setting. Episode 3 and 4 happened during the same time frame. Episode 5 should be happening after them. So far, whenever an episode doesn’t follow the previous one time-wise, the first sentence in the text says so. Episode 6, which is already out, states in its first phrase that it happens before 5. Rizumu and Mion joined since Episode 2, and yet they didn’t do anything nor appeared in 3-5. In episode 5, I guess they were in their respective rooms in the Trailer, or busy with something else. I’m gonna imagine they helped Aira make the melonpan she gave to the others. Aira still endorses the role of the boss mom of the group. I’m really curious as to how the New Prism Trailer works. I want a map of its interior. It probably has some space distortion system which makes it have infinite space inside. As said in Episodes 3 and 4, there’s a fully equipped kitchen in it after all. I’m guessing each character has their own room and there are vacant rooms too as more characters will join. I guess you could say this confirms no males will ever be added or else they’d be living together in the trailer with the girls, which is a no-no. And when Dressing Pafé will join, Leona and Dorothy will just share a room. Episode 5 was published on December 9, 2018. Episode 4 was released on July 27, 2018. Before Episode 4, episodes used to release at a pace of around one episode per month. But then there was suddenly a four-month gap between 4 and 5. Anyway, I think Director wrote most of the Pretty All Friends chapters in advance, but then the Teashop Outfits controversy happened. Seeing episode 4 is a story inspired by the Puchi Rascal collab, and that episode 6 is based on the Pretty All Friends Amo Café Valentine collab going from January 2019 to March 2019, I think Episode 5 was initially supposed to be about the Dash Store collab with the teashop outfits. But because the goods with the teashop outfits got canceled, they had to cancel the original episode 5 and asked Director to rewrite it. However, from July to December 2018, Kinpri SSS wasn’t done yet, and DIrector must’ve been busy working on it. He’s also busy writing the Road to Shiny Seven Stars chapters in the Kinpri mobage/ Prism Rush Live / PriRaRa. He even took some time to work on Hugtto Purikyua again before the series ended too. So he couldn’t find the time to rewrite Pretty All Friends Episode 5 until December, hence the 4-month gap. I think that’s also why Episode 5’s text is particularly long compared to the previous episodes, to make up for the delay. The Dash Store teashop goods had Mion and Rizumu on its key visual, so they would’ve definitely appeared in the hypothetical original episode 5. I think it’s a real shame those goods got canceled, and if my whole theory is right, it makes me even sadder about it. Rizumu and Mion barely have any official goods. 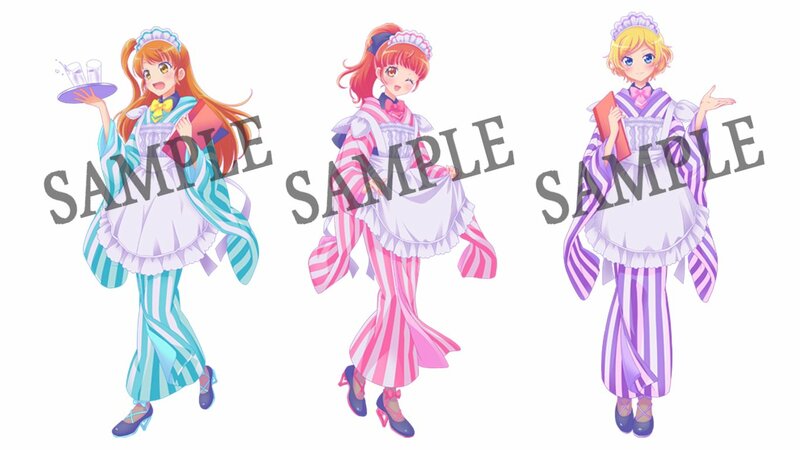 Pretty Rhythm characters as a whole probably don’t even have 10% as much as different official goods than the PriPara characters. So every opportunity for them to get more goods is a huge chance, and all Yakuza myself included were really sad about the teashop goods’ cancelation. It’s even more ironic as like I explained in the post covering the controversy, only Yakuza actually care about Pretty All Friends. 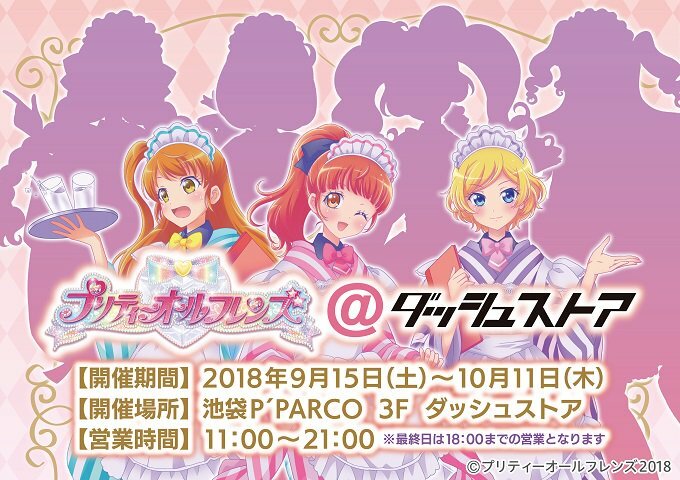 For example, the Amo Café collab currently ongoing has nearly every weekend a talk show event with one of the Pretty Rhythm seiyuu. In each event, the seiyuu comment an episode live and talks about the series as a whole. Some of the events, if not all, have Sound Director Nagasaki Yukio and Producer Ohba Shin attending too. Thanks to the Yakuza attending, I got reports on each one of them and I’m planning to translate them later. For now, there was one with Asumi Kana/Aira, Hara Sayuri/Rizumu, and Ookubo Rumi/Mia. 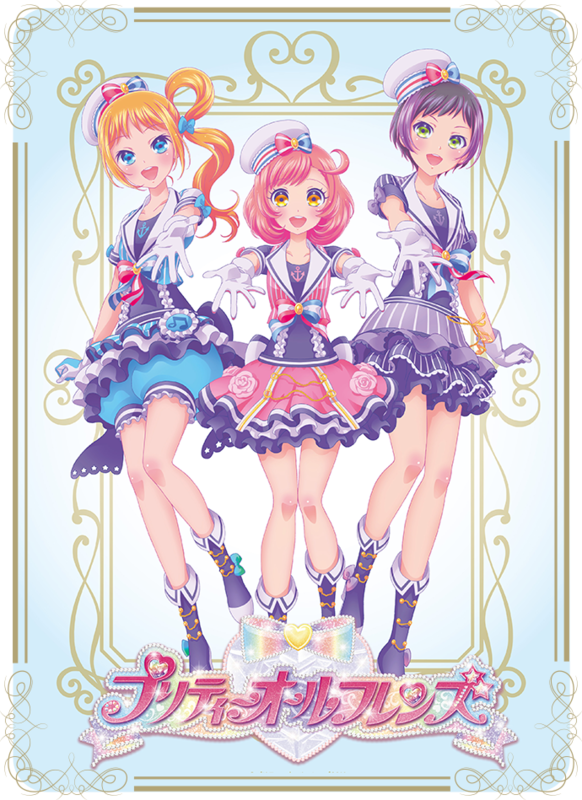 There’s one with Kato Emiri/Naru coming, and the last one will be Akaneya Himika/Laala on February 11, 2019. You need to buy a ticket for each event, and there’s a lottery because the seats are limited. And yet, pretty much every singe Yakuza on Twitter I know who watched Dear My Future managed to attend the Ookubo Rumi event on January 26, 2019. Meaning not many people must’ve applied for its tickets. (Obviously, there’s also the fact that DMF is the least popular season as not most people only saw RL and Kinpri). And one of the Yakuza said it was only women in the audience, except for one man. Like I already explained, most of the Yakuza are women. In summary, after the controversy, PAF went back to being a thing only older fans really care about, and yet people who don’t care about it made the company cancel the teashop goods. A real shame. Anyway. 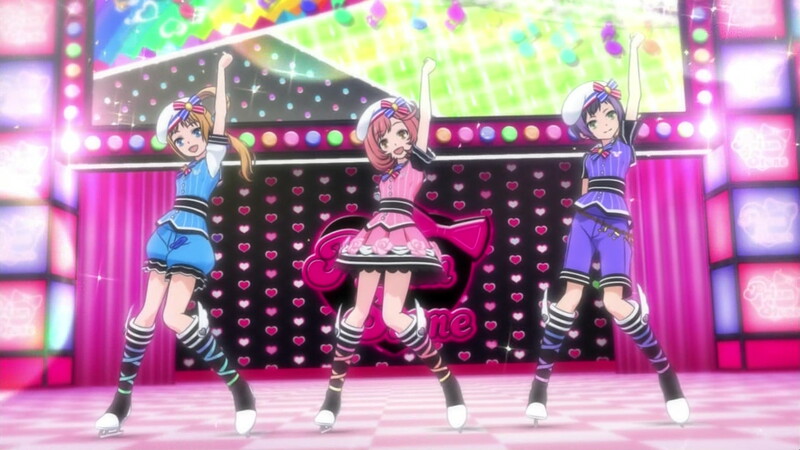 Most of the coords appearing in Pretty All Friends’ visuals are based on previous coords from the anime seasons. I call them “Pretty All Friends Pretty Remake” coords. For example, Happy Rain’s original coord from Rainbow Live looks pretty different than the new ones in Pretty All Friends Episode 5’s key visual. They still haven’t disclosed who is the artist drawing the PAF key visuals. I don’t think they will. Please read the Pretty Series History if you haven’t yet. Episode 6’s translation should be coming soon. Update on February 16, 2019: Because of a certain thing which happened with PAF Episode 7, it’s now certain Director Hishida isn’t the one writing the episodes. It’s still unclear if he’s at least supervising them or not, but it strongly seems that he isn’t. I’ll try to explain what happened in detail when I translate episode 7. I still believe in my theory that Episode 5 was delayed then rewritten because of the Dash Store collab incident though.